The Nokia 1600 is a part of Nokia's Ultrabasic series of mobile phones released in late 2005. The 1600 is designed for prepaid mobile phone services and is related to the Nokia 1110. It is notable in that it was originally released specifically to be used by customers in developing countries. The phone is noted for its durability and resilience to accidental drops. It sold 130 million units in its lifespan, making it one of the most successful phones to date. 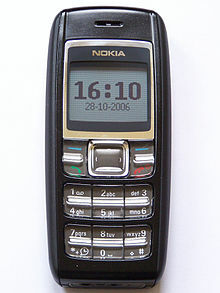 The Nokia 1600 mobile has a speaking clock, which was a novel feature when the phone was launched in 2005. A user could use the speaking clock by pressing the asterisk ("*") button during the display of the home screen. The phone also includes a ringtone composer which allows creating custom ringtones. Pre-composed ringtones can be transferred through a data cable. The phone has a basic calculator which can perform only addition, subtraction, multiplication and division. There are 14 pre-defined themes with 14 wallpapers and menu backgrounds. The menu features animated icons. ^ Momo, Cyrille (May–June 2005). "Wireless in Africa: Insights into Mobile Markets". IT Professional. 7 (3): 34–38. doi:10.1109/MITP.2005.74. Retrieved 2008-06-12.